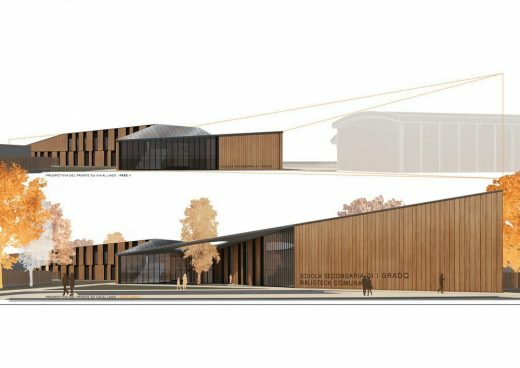 The competition was announced in September 2018 by the Municipality of Alpago, and was concerning the demolition of an old school building, the construction of a new middle school in several construction phases, its connection to the existing gymnasium and the entire outdoor area reorganization. This project aims to demonstrate that the school’s architectural shape, in its final phase, represents a logical and coherent growth of the first phase building. 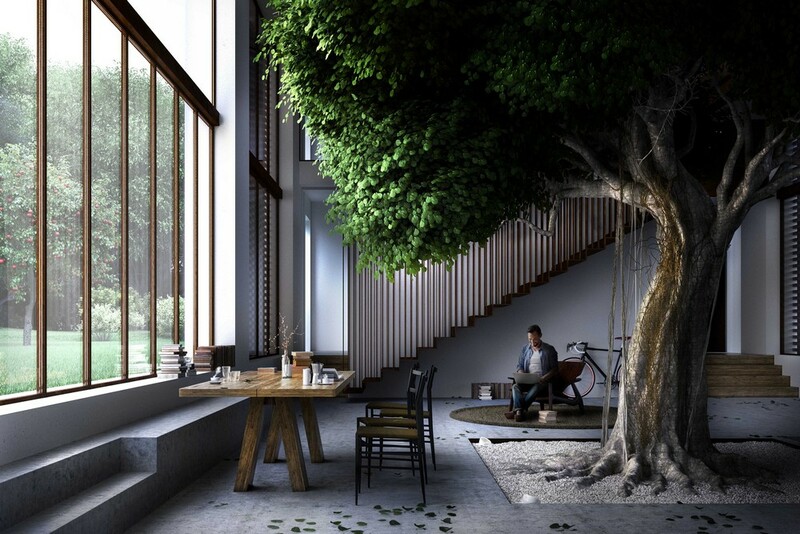 A growth, not an addition of pieces or pavilions. 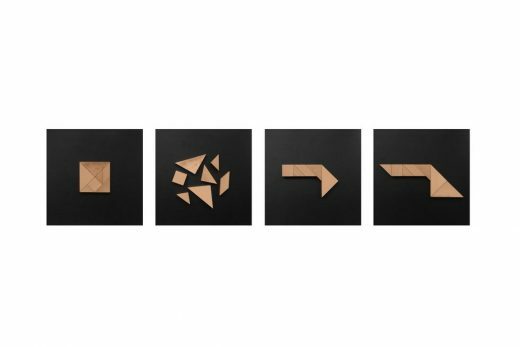 This concept shows a resemblance, conceptual and aesthetic (in the etymological sense of the term), with the Tangram ancient game : the starting square represents the abstract program, as well as the single pieces are the individual functions. The project can be considered complete once all the pieces have been sensibly aggregated. 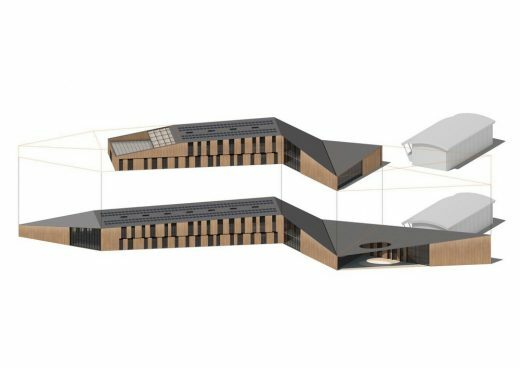 The building first phase, drawed in black in the plans and sections, is made up of a logitudinal two-level block, parallel to via De Gasperi, hosting all didactic functions (classrooms, workshops, spaces for special activities, etc. 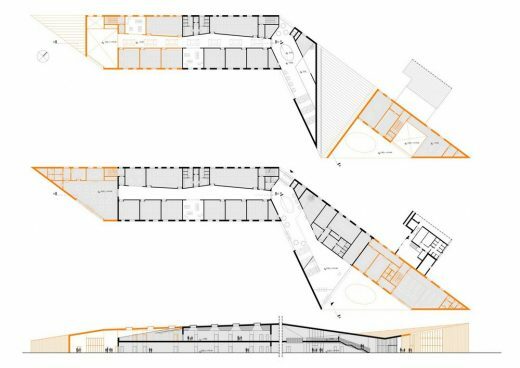 ), and from a double-height space bending towards Via al Lago and containing all administrative functions and a large “Agora” (square) with two entrances. The main stair is located inside the double-height Agorà and is made up of the ramp and a series of benches that make it usable as an auditorium or as a relational space. Thus, the Agora becomes a public space in which the horizontal and vertical connectivity converge, on which the common areas overlook (library, administrative functions etc). 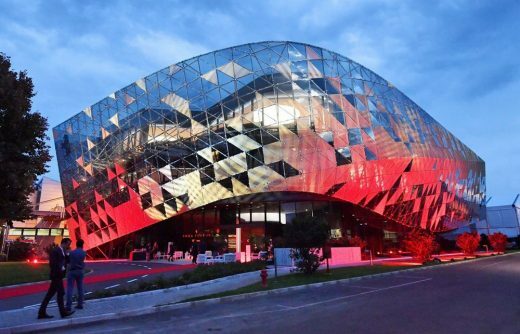 • first of all it allows to obtain, at the end of the works, a single building, hosting all functions. • determinates an internal connection between the Agora and the old gym. 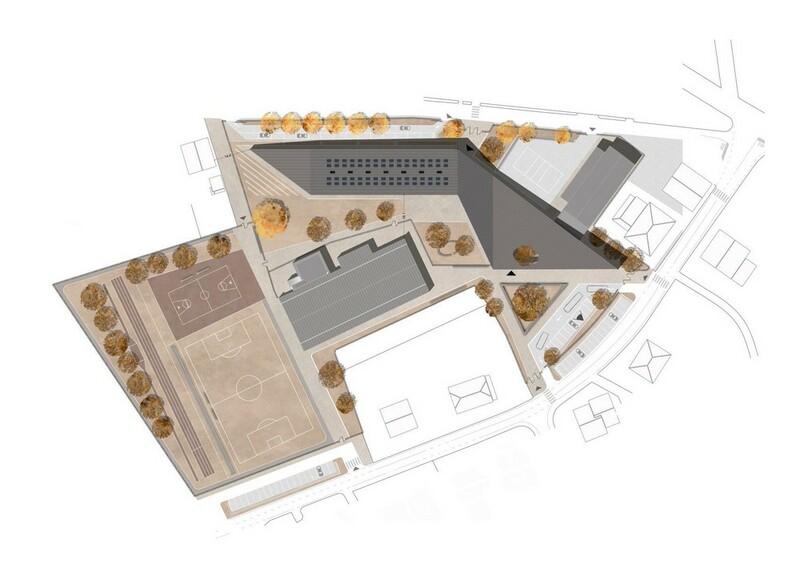 • The new volume, hides the old gym from the main entrance, minimizing the inevitable difference between the architectures of the new and the old building. DESIGNING WITH TANGRAM from LAD on Vimeo. During the demolition of the old school and during the construction of the second section, the main access to the building will be the one from via De Gasperi, whose strategic importance is summarized by the sketch of the “Agora”. 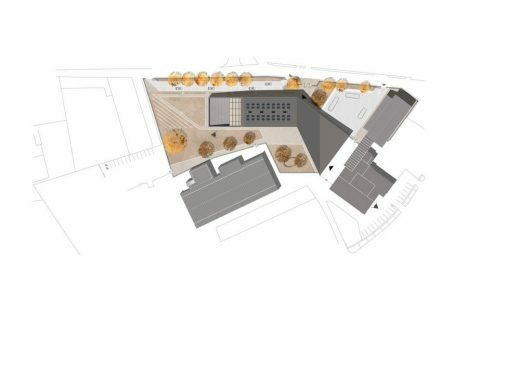 The sketch clarifies the spatial meaning of the agora, which is configured as a device, connecting the external space on via al Lago and the one on via De Gasperi, as if it were a street or a square. 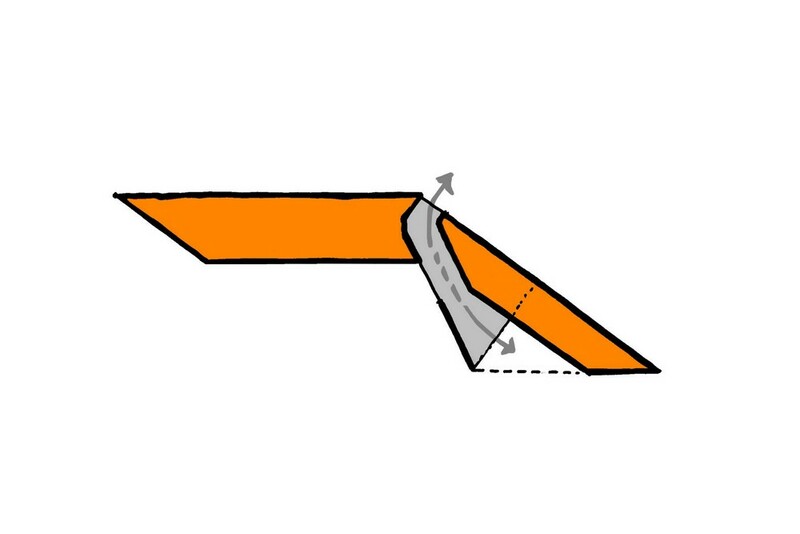 That’s why its internal walls are designed like external elevations. 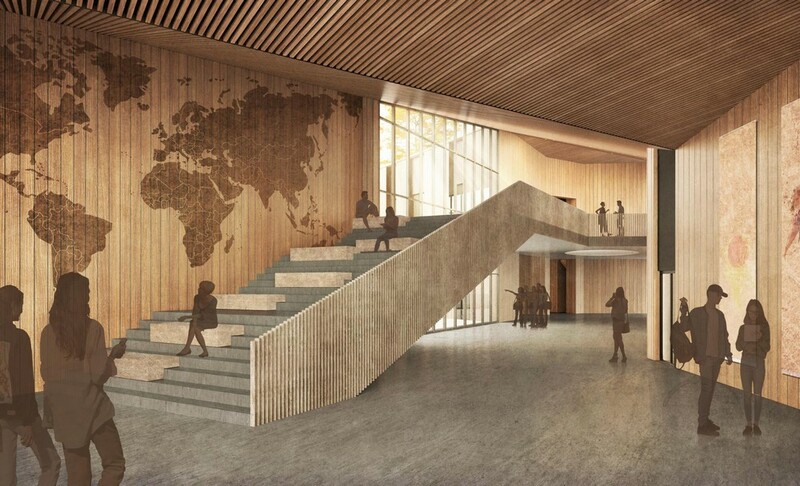 Once phase 2 has been completed, it is possible to further expand the building, this time in correspondence with the South terminal, with three classrooms, educational spaces and the canteen, drawed in orange in plans and sections. 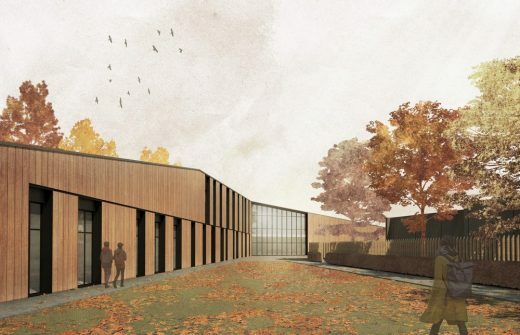 The canteen is a triangular block, built with an independent structure, and connected to the educational spaces. Phase 2 and Phase 3 are chronologically reversible, or they can also be performed simultaneously. The new school is a longitudinal building with sloped roofs, both in the first phase and in the final configuration. We investigated the pitched roof theme with a contemporary design that does not indulge in historicism but seeks an integration with the context. 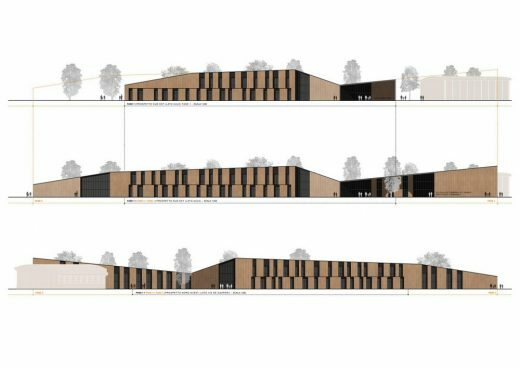 • It creates a dialogue with local architecture, defined by the use of wood and sloping roofs. The “Tabià”, the typical shelter of the province of Belluno, is the most direct architectural reference, both in terms of form and iconography. • It gives the building a domestic and informal tone. From the environmental point of view it is very important to consider the orientation of the building: the two-level linear block, containing classrooms, is oriented on the south-west / north-east direction, thus all the rooms enjoy direct radiation of sunlight (and related thermal gains) during the morning; the agora is instead oriented on the west / east axis and is therefore exposed to the south, so that it can maximize the thermal gains in the middle of the day. This strategy allows a great energy saving and therefore contributes to less use of the heating system. The load-bearing structure of the building uses X-Lam type wooden load-bearing panels. 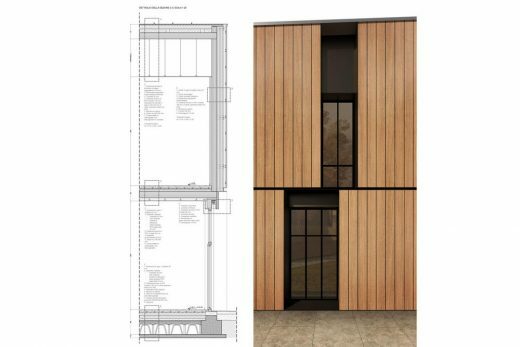 The vertical facades are equipped with a double layer of 20 cm recycled PET insulation and covered with an vertical slat system in spruce wood, using the wood accumulated by the recent climatic catastrophe in Veneto.